How quickly can you prepare a delicious dish using only ingredients that follow a plant-based diet? 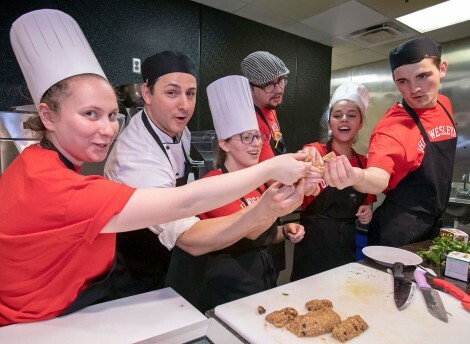 Ohio Wesleyan University students demonstrated their ability to meet this challenge March 27, when they won first place at AVI Fresh’s annual Platinum Chef Ohio cooking competition. Teams of students from OWU, University of Mount Union, Kenyon College, Hiram College, Malone University, and Tiffin University were put to the challenge of incorporating two mystery ingredients into plant-based dishes: gooseberries and bok choy. Under the direction of an AVI chef, each team had exactly one hour to prepare an award-worthy dish. The OWU team consisted Cody Gault, Curt Sprunger, Sydney Nadler, Sam Rodrigues, and Jessica Blankenship, coached by John Winpisinger, AVI’s Director of Culinary Operations. Appetizer – spring vegetable tart with cauliflower crust. Entrée – grilled vegetable tamale steamed in bok choy leaves with jicama-gooseberry slaw and avocado crema. Dessert – light and fit duet: pineapple smoothie and banana-almond energy bites. The theme was inspired by special guest Jane Esselstyn, an author and advocate for a plant-based diet. Esselstyn is a published author of numerous plant-based recipes and presented on the importance of this diet during her visit. Esselstyn served as a judge for the competition along with OWU student Peyton Hardesty and University employees Joe Peterson, Lauri Strimkovsky, and Brian Emerick. Dishes were scored on a scale of 1-5, with the highest total determining the winner. The OWU team earned a cash prize of $1,800 for first place. Hiram received $750 for second place, and Mount Union earned $450 for third. 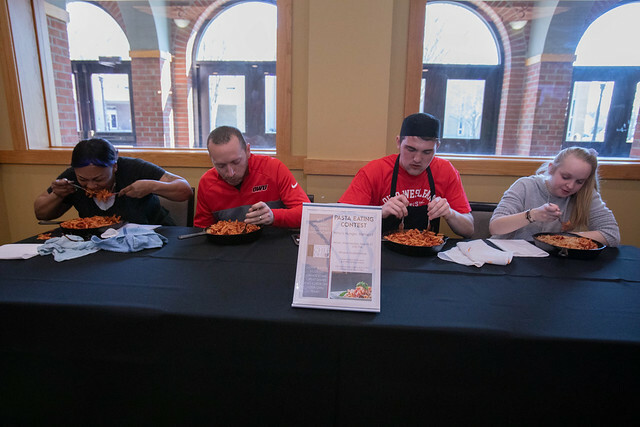 Along with the Platinum Chef competition, the night included a pasta-eating contest, a DJ, and a prize wheel with options of Starbucks gift cards and candy. Curt Sprunger, a member of OWU’s winning cooking team, also won the pasta-eating competition and a gift card to Bishop Café & Grille. In addition to bringing the Platinum Chef competition to Ohio Wesleyan, AVI this semester also has remodeled Bishop Café and Grille in the campus center and opened a Boar’s Head Deli in the science center. AVI’s next plans entail revamping the Bishop Café menu using feedback from the spring dining survey and developing the Creations DIY area in Smith Dining Hall.